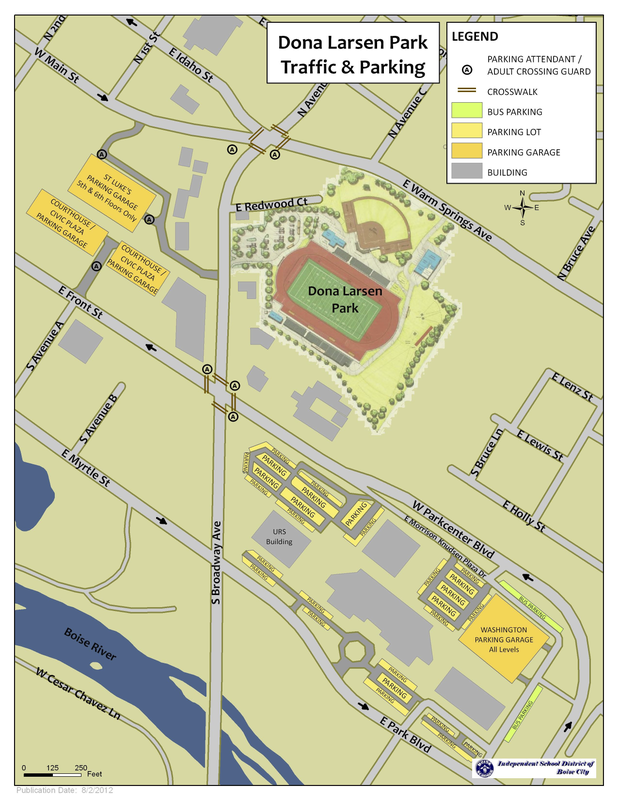 The parking agreement between Boise State and URS has now been updated to include parking for the high school football games. In addition, parking will also be available in the Ada County Courthouse/Civic Plaza parking garages accessed from Front Street at Avenue A. According to Planning and Zoning there are some 1,700 parking spaces surrounding the URS building with most in the large, five-story parking garage at the east end of the campus. It appears a few hundred more spots may be available with the agreements the School District has put together with Ada County and St. Luke’s. The map above also shows there will be crossing guards at the intersection of Front Street and Broadway Avenue, and also at Broadway and Warm Springs Avenue. Spectators will be crossing Front Street from the URS parking. One would think the Carl’s Jr. and Deli George will have a great opportunity to peel away some customers before and after a game. The map above does not show where parking is restricted. This is important. This includes the small parking lot west of the football field accessed from Broadway Avenue. Also, the strip mall across Broadway is not available. The map legend is superimposed over the streets in the new Parking District. The map does not show the entrance to Dona Larsen Park. It is on the west end at Broadway Avenue. People who have driven along Warm Springs Avenue may get confused and think there is an entry gate on Warm Springs when in fact the structure that was built there is a non-functioning historical replica of the old entry to the public school field. The entrance to Dona Larsen Park is on the west side on Broadway Avenue. The faux entrance on Warm Springs Avenue is there for historic display purposes only. While the Boise schools and their spectator patrons will soon learn where they can park (and grab a bite to eat) we need to remember there will be visitors from the schools in the Meridian School District as well as from Canyon County. Most Thursday and Friday nights will bring first time visitors to our neighborhood looking for an easy parking spot. So the first season will be a test of the Parking District and how well the School District, Boise State, and others get the word out on where parking is allowed and encouraged. (East End Parking District map below). 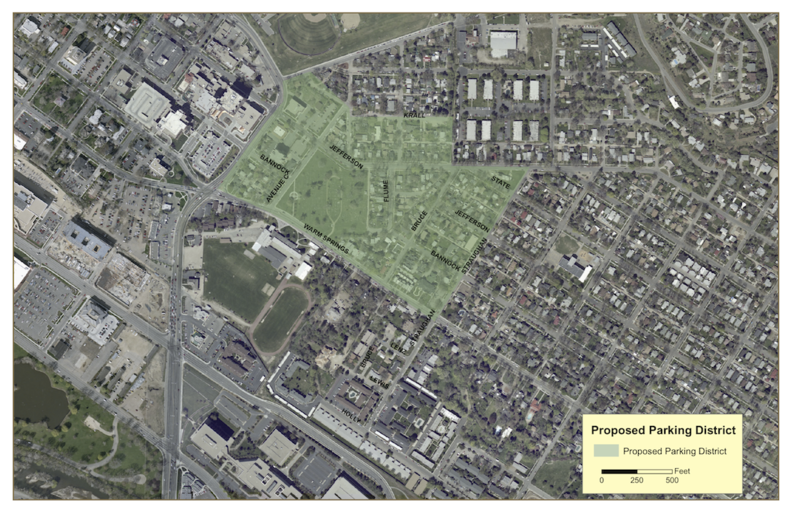 The Boise City Council authorized the new East End Parking District in the summer of 2012 to help mitigate the impacts of spectator parking at Dona Larsen Park.